This species is accepted, and its native range is U.S.A. to Tropical & Subtropical America. Nativa en Colombia; Alt. 0 - 500 m.; Llanura del Caribe, Orinoquia, Pacífico, Valle del Magdalena. Perennial; mat forming. Stolons present. Culms decumbent; 8-60 cm long. Ligule an eciliate membrane. Leaf-blades flat, or convolute; 3-14 cm long; 3-7 mm wide. Inflorescence composed of racemes. Racemes 2(-3); paired; unilateral; 2-8 cm long. Rhachis narrowly winged; angular. Spikelet packing abaxial; regular; 2 -rowed. Spikelets solitary. Fertile spikelets sessile. Spikelets comprising 1 basal sterile florets; 1 fertile florets; without rhachilla extension. Spikelets ovate; dorsally compressed; turgidly plano-convex; acute; 3-4 mm long; falling entire. Glumes one the lower absent or obscure, or two (rarely); reaching apex of florets; thinner than fertile lemma. Lower glume when present ovate; 0.1-0.2 length of spikelet; hyaline; 0 -veined. Lower glume lateral veins absent. Upper glume elliptic; 1 length of spikelet; coriaceous; without keels; 3 -veined. Upper glume surface puberulous. Upper glume apex acute. Basal sterile florets barren; without significant palea. Lemma of lower sterile floret similar to upper glume; elliptic; 1 length of spikelet; coriaceous; 3 -veined; acute. Fertile lemma ovate; gibbous; 2.5 mm long; indurate; pallid; without keel. Lemma margins involute. Lemma apex acute. Palea involute; indurate. Europe: southwestern, southeastern, and eastern. Africa: north, Macaronesia, southern tropical, south, middle Atlantic ocean, and western Indian ocean. Asia-temperate: Soviet Middle Asia, Caucasus, western Asia, Arabia, China, and eastern Asia. Asia-tropical: India, Indo-China, and Malesia. Australasia: Australia and New Zealand. Pacific: southwestern and north-central. North America: northwest USA, north-central USA, northeast USA, southwest USA, south-central USA, southeast USA, and Mexico. South America: Mesoamericana, Caribbean, northern South America, western South America, Brazil, and southern South America. Racemes paired (rarely 3), each 2–8 cm. long, the spikelets borne singly in 2 rows on a rhachis 1–2 mm. wide. Spikelets 3–4 mm. long, ovate, plump, green. Inferior glume present on at least some spikelets as a tiny scale. Superior glume somewhat coriaceous, nearly always obscurely pubescent. Inferior lemma somewhat coriaceous. Superior lemma pallid at maturity. Alabama, Argentina Northeast, Argentina Northwest, Argentina South, Arizona, Arkansas, Bahamas, Bermuda, Bolivia, Brazil North, Brazil Northeast, Brazil South, Brazil Southeast, Brazil West-Central, California, Central American Pac, Chile Central, Chile North, Colombia, Costa Rica, Cuba, Dominican Republic, Ecuador, El Salvador, Florida, Galápagos, Georgia, Guatemala, Guyana, Haiti, Honduras, Idaho, Jamaica, Juan Fernández Is., Kansas, Kentucky, Leeward Is., Louisiana, Maryland, Mexico Central, Mexico Gulf, Mexico Northeast, Mexico Northwest, Mexico Southeast, Mexico Southwest, Mississippi, Missouri, Nevada, New Jersey, New Mexico, Nicaragua, North Carolina, Oklahoma, Oregon, Paraguay, Pennsylvania, Peru, Puerto Rico, South Carolina, Suriname, Tennessee, Texas, Trinidad-Tobago, Turks-Caicos Is., Uruguay, Utah, Venezuela, Virginia, Washington, Windward Is. 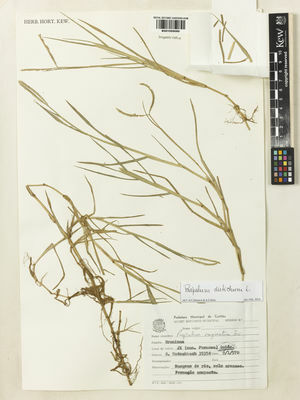 Digitaria disticha (L.) Fiori & Paol. Dimorphostachys oaxacensis (Steud.) E.Fourn. ex Hemsl. Paspalum distichum var. digitaria (Poir.) Hack. Paspalum distichum var. paspalodes (Michx.) Thell. Paspalum schaffneri Griseb. ex E.Fourn. Sosef, M.S.M. (2016). Taxonomic novelties in Central African grasses (Poaceae), Paniceae 1 Plant Ecology and Evolution 149: 356-365. Zuloaga, F.O., Morrone, O. & Pensiero, J.F. (2014). Gramineae VI Flora del Paraguay 45: 1-392. 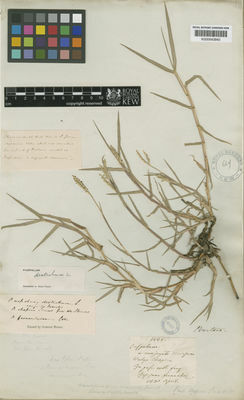 Editions des Conservatoire et Jardin botaniques de la ville de Genève. Verloove, F. (2013). New xenophytes from Gran Canaria (Canary islands, Spain), with emphasis on naturalised and (potentially) invasive species Collectanea Botanica 32: 59-82. Damanakis, M. & Scholz, H. (1990). 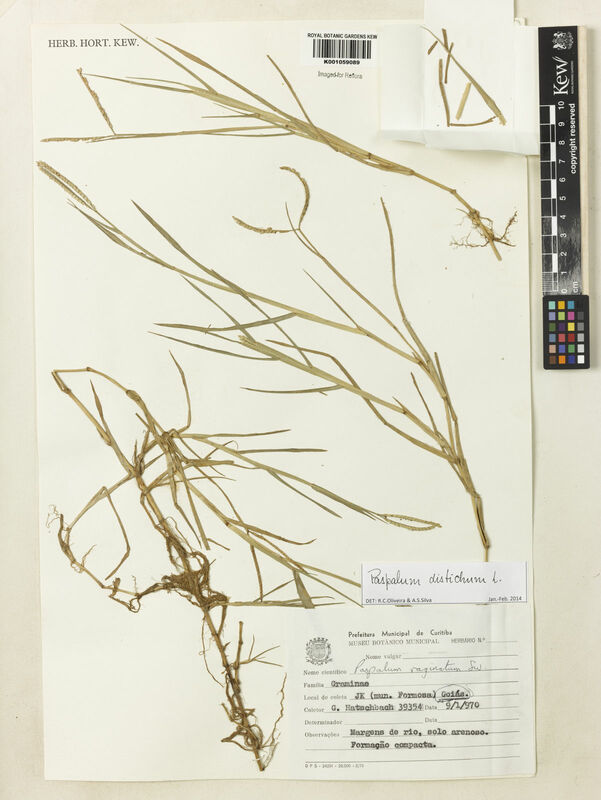 Phytogeographical notes on the Poaceae of Greece Willdenowia 19: 413-423. Woodroffe, C.D. (1985). Vegetation and flora of Nui Atoll, Tuvalu Atoll Research Bulletin 283: 1-18.